Comedian Michael Jr. enjoys making people laugh, but he doesn’t want his audiences to go home without being challenged and inspired, too. That’s why he mixes stories about everyday life – so-called “serious” stories – into his routine. He wants to challenge how people think. Michael Jr., who is known for his hysterical routines and his Christian faith, stars in an upcoming film, Michael Jr.: More Than Funny, that was filmed before a live audience. It will be in theaters for one night only, Oct. 18. 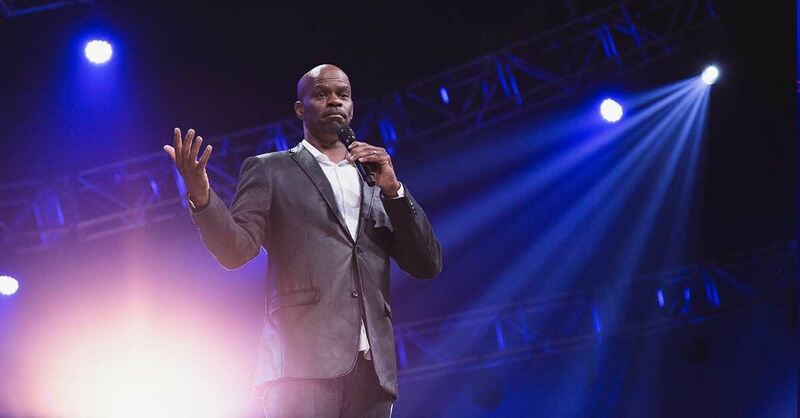 He is popular among the faith community but is known in mainstream circles, too, having appeared on late-night shows such as NBC’s The Tonight Show and ABC’s Jimmy Kimmel Live. Of course, you likely knew that. Michael Jr. became one of America’s top comedians thanks to his perfect sense of timing, crazy facial expressions, and unique observations about everyday life. (“Did God give chickens wings just for us? They don’t even use them.”) He told Crosswalk he was funny as a child, even though he grew up in a home where children couldn’t talk when adults were speaking. “So I really learned how to be very observational and then be strategic about when I might say something.” He still uses that strategy. The “bulk” of comedy, he said, involves observing life. 3. It’s not politically correct. 4. It’s more than just jokes. For more information or a list of theaters, visit MoreThanFunnyMovie.com.